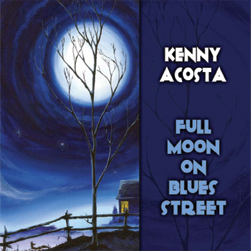 Samples from "Full Moon On Blues Street"
Kenny Acosta - It is a proven fact, a good product is easy to sell. Kenny Acosta may be the product you've been waiting for! His soulful voice and scorching guitar are combined with a tight and funky rhythm section that is one of the best ever to come out of South Louisiana. Kenny has established himself as a master bluesman in all his travels from the Florida Keys to Fairbanks, Alaska and all points in between. At a moments notice Kenny's grooving down Funk Street, swinging over to Latin Parkway, recollecting on Oldies Cove, or ripping down R&B Lane. With forty years experience he is a professional and an adept entertainer. Mayor Bobby Simpson of Baton Rouge, made Kenny honorary Mayor for a day at Baton Rouge's Fest For All on the Blues Stage, during Blues Week in 2003. This is the first such award bestowed upon a Baton Rouge Blues man, ever. Kenny won the Baton Rouge Blues Society Blues Challenge in 2003 and represented the Baton Rouge Blues Society in January 2004 at the International Blues Competition held in Memphis, Tennessee. During his early years, 1972 - 1979, Kenny Acosta was a main stay in the American Blues scene. Playing out of Austin, Texas, he fast became a popular and noted blues performer. A regular at Armadillo World Headquarters, Kenny preformed regularly with Marsha Ball, Kim Wilson, W.C. Clark, and Stevie and Jimmy Vaughn. Coming home to Baton Rouge in the fall of 1978, Kenny teamed up with "Cadillac" Cook to form Kenny Acosta and the House Reckers. Through the 80's and 90's Kenny traveled the Gulf Coast and the southern states. Kenny released his first solo album Hot Dog in 1984. He was awarded best original song for "Justice Blues" at the 1989 Baton Rouge Blues Festival. At that time, this festival was the 2nd largest Blues Festival in the country. Also in 1984, KRVS FM radio station out of Lafayette, Louisiana, awarded Kenny a plaque for being their most requested Blues musician. During the years of 1986-1994, Kenny was a regular playing at the New Orleans Jazz Festival. In 1995, Kenny needed some time off to help raise his first and only son, Zeke. Five years ago Kenny started producing his own festival, the Fall Full Moon Festival of Blues at Hemingbough, where he has hosted such Blues greats as Henry Gray, Big Luther Kent, Raful Neal, Kenny Neal, Lil' Ray Neal, Joey Gilmore (2006 IBC Winner), Bugs Henderson, Chris LeBlanc and John Lisi. The festival is growing so fast that in its second year, the festival was featured in LPB'S award winning documentary, "Raining In My Heart". Kenny's songs create a story like atmosphere. He is a wonderful Cajun storyteller and jokester. Kenny "has been lots of places and done lots of things", but bottom line is, he will entertain you with his professionalism and charisma.